We have bronzing bulbs and tanning bulbs! We carry Wolff™ bulbs, Sunergy bulbs, Sun Fushion bulbs, Radiance Trio Advantage bulbs, ReNew facial bulbs! To Order Call (630) 400-1121 Monday - Thursday 9:00 AM to 2:00 PM C.S.T. To help your tanning bulbs (lamps) last longer and give the great tanning results you desire, it is advisable that you follow a few tips to keep you tanning bed and lamps (bulbs) in optimum shape. This will also help you achieve a great tan. 1) Periodically clean your acrylics thoroughly with an approved tanning bed acrylic cleaner. DO NOT use harsh cleaners! Do Not use Windex™, 409™, or other such cleaners. These cleaners can dull your acrylic making it hard for light to pass through and reducing your lamps tanning power. Power Kleen™ tanning bed acrylic cleaner is a safe cleaner for tanning bed acrylics. Power Kleen™ tanning bed acrylic cleaner can be purchased HERE! will allow light to pass through without being defused by dust, skin oils, tanning lotion residue, and grime. 2) Clean all the reflectors behind the bulbs (lamps) when you change the bulbs. 3) Replace your starters when you replace your tanning bulbs (if your unit uses them-not all do). 4) Use a soft cloth that will not scratch your acrylics when cleaning them. 5) Replace all your lamps at one time and the lamp starters too (only if your unit uses lamps starters). We carry many types of tanning lamps / bulbs. We carry more than are listed here so please contact us if your desired lamp is not shown. What Is A Tanning Lamp? A tanning lamp (tanning bulb) emits UV light and this light that is created acts on the skin to produce melanin. Melanin is produced in melanocyte cells. It can take a few as five minutes under a tanning lamp to create the same effect of being out in the sun for two hours. Tanning lamps also helps the body produce vitamin D just like the sun. How Do Tanning Bed Lamps (Bulbs) Work? Both commercial tanning lamps or home tanning lamps emit ultraviolet rays so your skin will tan. Inside of the tanning lamps/bulbs contain inert gasses, mercury, and a phosphorus coating. By adding electricity to the lamps, the mercury looses its satiability this releases this energy in the form of ultraviolet light. This ultraviolet light is like the suns ultraviolet light and will cause the skin to tan and produce vitamin D.
You should clean your lamps, acrylics, and lamp reflectors regularly. This will make sure you get the best tan possible from your tanning equipment. Make sure you use a cleaner that is safe for acrylics (this is the clear part you lay on). Tanning bed acrylics can be damaged by harsh cleaners. They can crack and dry out. Tanning bed acrylics can also be dulled and this will make it hard for light to pass through the acrylic. 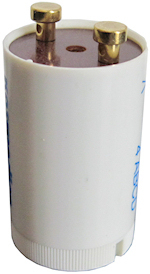 This will diminish your tanning lamps (bulbs) tanning power. Most tanning lamps (bulbs) last around 1,000 hours but are strongest when they are new. You should replace all your tanning lamps (bulbs) at the same time. If you have an older bed, your tanning bed may use lamps starters and these should be replaced at the same time also. Check your lamp life to determine if you should replace your tanning lamp bulbs. Check your tanning beds acrylics to see if they need to be replaced. Wolff™ is a brand name tanning lamp. Most people are familiar with this brand of tanning lamps. Dr. Wolff was a German scientist who studied the use of ultraviolet light for indoor tanning. He made specialized tanning lamps that were reliable and efficient in giving a great tan. There are many brands of tanning lamps. You should purchase lamps that are rated for your tanning bed or tanning booth. Different lamp manufacturers will have different lamps options. Some tanning lamps use built-in reflectors to help concentrate the UV light that hits your skin. This will dramatically increase the quality of your tan. High end tanning lamp bulbs will have these and more options. Why does the price on tanning bed lamps vary so much? Bronzing lamps (bulbs) look similar to ordinary tanning lamps (bulbs). Bronzing lamps (bulbs) have a lower level of UVB. This allows for a deep dark tan and will tan the skin faster. Bronzing tanning lamp bulbs are great for experienced tanners or people with dark skin. The color of the tanning lamps has nothing to do with the tanning power of the lamp. Some lamps are pink, blue, or other colors. The colors are put in by the tanning lamp manufacturer. The color depends on the amount of phosphorus and other chemicals the manufacturer uses inside of the tanning lamp that causes the colors in the lamp. These chemicals are rare elements and will add to the cost of the tanning lamp (bulbs) that you purchase. These different elements will enhance the tanning effect you will get from your lamps. There are different kinds of lamps/bulbs. There are regular tanning lamps, red light lamps, and bronzing lamps. Tanning beds can come with a combination of these types of lamps. Some lamps can be just for "face". Some lamps (bulbs) are just "body" lamps (bulbs), and others will have a combination of arm / body lamps (bulbs). Bronzing lamps (bulbs) create a deep bronze glow to the skin and tan the skin faster than regular tanning lamps (bulbs). Bronzing tanning bulbs are great for experienced tanner or people with dark skin. Bronzing tanning bulbs will help to boost your tan in your skin type tans easily. Bronzing tanning bulbs are not recommended for people with light skin or beginner tanners. You should build up you tan before using bronzing lamps. Red lights do not tan the skin since the wave lengths are between 630-660 nanometers which contain no (UV) ultraviolet light. 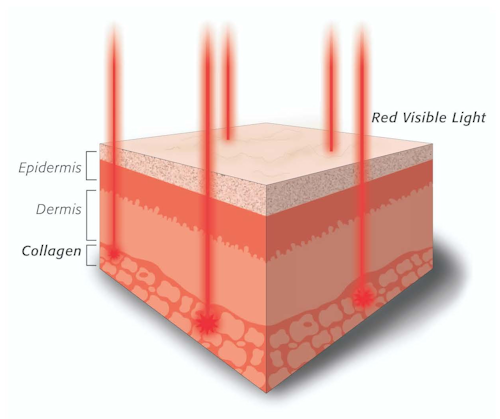 Light photons penetrate the skin to stimulate the body's natural process of producing collagen. Stimulating collagen production that may help minimize wrinkles, smoothes small lines, and renew the skin's texture for a more youthful appearance. Price of tanning lamps can vary. Higher end tanning lamps (bulbs) will have a higher price. This is an example of getting what you are paying for. Better lamps (bulbs) will cost more than cheaper tanning lamps. Higher end tanning lamps will last longer and give a better tan than cheap tanning lamps (bulbs). 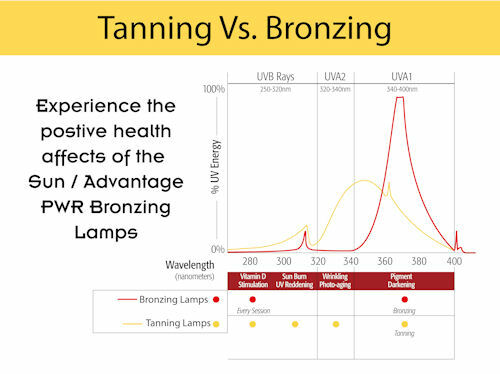 The higher end tanning lamps will have options that will not come in the cheaper lamps like swirl glass bulbs and internal lamp reflectors that direct the UV light out of the front of the lamp only allowing for better tanning. All these things adds to the manufacturing cost of the tanning or bronzing lamps. Order Tanning Bed Lamps Today! *Easily pay with credit or debit via secure PayPal Server.